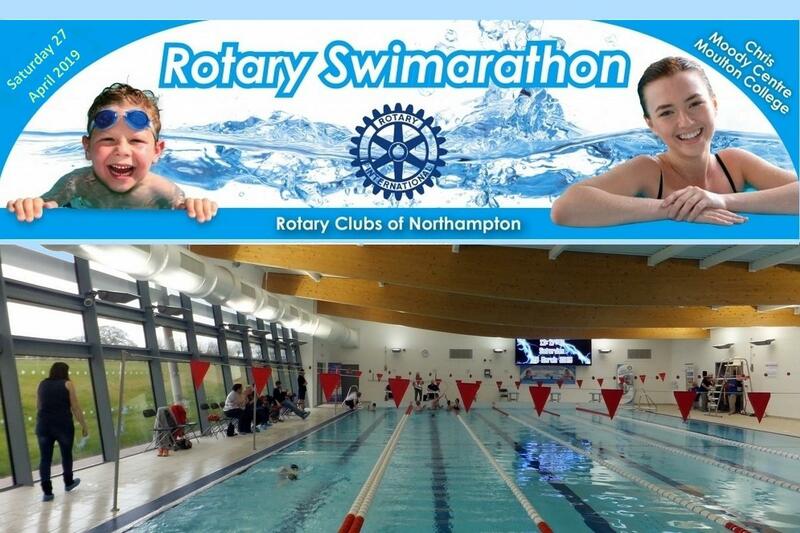 Our Swimarathon is brought to you by the four Rotary Clubs of Northampton and is an exciting fund raising event. It will be enjoyed by all the participants. Half the money you raise in Sponsorship will go to the charity, club or good cause of your choice. All ages and swimming abilities are welcome to participate. This is not a race or a competition. It is a fun event for your participation and enjoyment. Can you put together a team (or teams) of 6 swimmers to swim, relay style, for one hour and join this major local fund raiser. There were 32 Teams participating, which is the largest number of teams and swimmers participating in our events.since our first in 2013. They swam a total of 1660 lengths - over 26 miles in total. The ages of swimmers were very varied with at least 3 swimmers aged 5 years. The total pledged was the largest we have ever received. The most we had previously receive from Individual Sponsorship was the £4,949 from last year, when we werem also able to claim £694 in Gift Aid. We also received £1,600 from our business sponsorships. Plus the generous donation of 35 “goodie” bags from our Principal Sponsor, Goggles.